Check back here for news, tips, quips, photos, books, training opportunities, and more. Better yet, subscribe via email! See something you like? Don’t forget to share it! YOU are important. Do you have an article, blog post, or personal experience to share on DTIWOMEN.COM or our Facebook Page? Subscribe to DTIWOMEN.COM to receive an email each time we post something new. It’s easy. Just enter your email address in the field indicated below. Today I had the honor and privilege to spend several hours on the range with a young woman who Poolie who will ship out to Boot Camp at the Marine Corps Parris Island is a month. She had never touched a rifle, let alone fired one, before today. There was some anxiety in her demeanor. Some doubt in her mind. What would it feel like to shoot a rifle? Would the recoil hurt? How loud was the noise? Could she, would she ever hit that target? I talked and she listened. I drew pictures and she saw. I fired first and she observed. And then she took her turn. 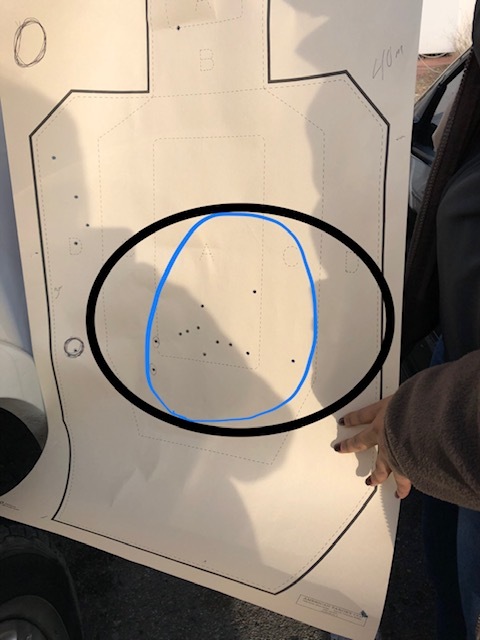 At 40 m we found two of her hits on the target, but they were spaced about as far apart on the paper as they could be and still be on the paper! Couldn’t even find evidence of the third shot.. Ah, I said. Do you remember if your eyes were open? In answer her eyes opened very wide! Hmmmm. Maybe not as much as they should have been when she pressed the trigger. But she worked and she listened and she worked some more at it. And soon the concept of holding the rifle as steady as possible while pressing the trigger straight flat back took hold. The holes in the paper got closer and closer together. The recoil and the noise became non-events. And then she learned to correct herself. She learned to stop the trigger press when she felt herself pushing the rifle forward to meet the anticipated recoil and to restart the trigger press in one smooth movement. Take a look at her doing just that on the video. She learned to reset or catch the link of the trigger between shots. Take a look at the circled area on her paper target. Perhaps a smidge low you might say, but not if you know the rifle was previously sighted in for a slightly longer distance that she was working at. Look more at the group and the consistency. The anxiety disappeared. The doubt was lifted. And what recoil and noise? I can’t wait to hear about her rifle training at Boot Camp! In 1636, the General Court of The Bay Colony, under Governor John Bradford, passed an ordinance: "……no person shall travel above one mile from his dwelling-house, except in places where other houses are near together, without some arms; upon pain of twelvepence for every fault." p 141 of Divine Rebel: The Life of Anne Marbury Hutchinson, by Selma Williams. Even the Puritans did not take self-protection and protection of the innocents lightly. Did this mean in worship too? Being in our houses of respective worship today does not mean giving up our capability of self-defense any more than it did in 1636. The DTI Women Defensive Handgun Retreat at @The Historic Elk Mountain Hotel in WY this past weekend was a memorable event. To quote one attendee, spending the weekend with " amazing, fabulous, gritty and grand women" was the place to be. There were real ranchwife-cowgirls at the Range on the range, medical professionals, an anthropologist, a gun range/store owner, a stay at home mom and moms and grown daughters and mother-in-law and daughter-in-law. Three of them had their Gun Tote’n Mamas handbags with them. They were from Wyoming, Illinois, Texas and Oklahoma. What they had in common though was the determination to pertect their defensive skills and learn more about competent gun handling. They struggled with heavy triggers and carry pistols that were small for their hands and holsters that were less than ideas. This is not an easy class and they are told it would not be fun, but would be a lot of work! They found that out and relished the challenges, including the WY wind! And the moose in the parking lot on Sunday morning! Each night they returned to the hotel for wonderful dinners placed graciously in front of them by Chef Susan with desserts beyond description! And they went home on Monday, tired but confident. What a weekend! DTIWomen was honored to have Kelsey Scribner of the Wyoming Gun Company in class last weekend at Elk Mountain Hotel! Both her knowledge and attitude about women in this industry are impressive. Wendi Lankister, who teaches classes for women at Wyoming Gun Company was my assistant instructor for the Elk Mountain defensive handgun class. How fortunate women customers are who have these two women along with others when they visit the store/range. Last weekend I had the honor and privilege of speaking at the fifth The Well Armed Woman, LLC Leadership Conference, 2018, in Branson, MO. I spent two hours talking to the entire group of chapter leaders in attendance about the uniqueness of training women in firearms. What an event! I have been teaching in this industry for a very long time, but to stand in front of over 400 women in one room who are motivated and dedicated to teaching other women about safely gun handling as well as accurate shooting was far beyond the imagination as little as six years ago! Congratulations to TWAW for reaching so many! Below are a couple of pictures from my time on stage. My lecture includes serval interactive exercises. Here is a picture of one of those two exercises where I was assisted by Lt. Col. Dave Grossman and Glen Stilson, both of whom also presented at the conference. Thank you gentlemen! And a very special thanks to Gun Tote’n Mamas and Claudia Chisholm for making this all happen! DTIWomen is pleased to have been part of this! Thank you all! Every student is unique, but some bring sets of challenges which would keep other people at home. Lyn came with her husband and son for a weekend of training. They worked hard in the MUD in the rifle class while she fortunately did not to do that! But she did have to work, and work hard in the basic handgun class. 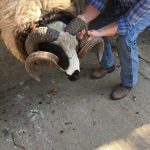 Trembling hands, pounding heart and rapid breathing are everyday experiences for her, but now she had to think through new skills and knowledge at along with them. That takes mental concentration. That put her in survival mode, just like she is everyday with the familiar demands on her daily life. But to learn defensive handgun skills, she applied that same survival mode mentality. She learned by being in the moment. She immersed herself in each step of each skill so that she "learned" it. Each step became connected to the others: draw, grip, sights, trigger, recoil, reset. They were each dependent upon the other. She learned and she mastered. A good lesson for us all. Being in the moment helps us learn! "Teaching Women for Women" is now listed on vicki or through the web page for scheduling and details. Vicki has been teaching this class with a slight variation for over fifteen years, (although she has been teaching defensive firearms for over thirty). The course is called, "Instructional Challenges: Teaching the Female Officer", and has been taught to male instructors at police and sheriff departments, state law enforcement training academies and associations, federal agencies and academies, ILEETA and IALEFI and for United State Marine Corps rifle instructors at Parris Island. She has also written numerous articles for various magazines including law enforcement publications. 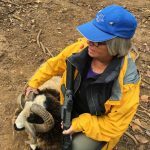 She has co-authored two books with Diane Nicholl on this subject: "Teaching Women to Shoot" and "Women Learning to Shoot". Both available through DTI or on Amazon as hard copies or ebooks. The DTI Women Defensive Handgun Retreat at @The Historic Elk Mountain Hotel in WY this past weekend was a memorable event. To quote one attendee, spending the weekend with " amazing, fabulous, gritty and grand women" was the place to be. 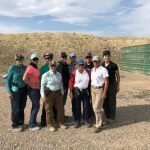 There were real ranchwife-cowgirls at the Range on the range, medical professionals, an anthropologist, a gun range/store owner, a stay at home mom and moms and grown daughters and mother-in-law and daughter-in-law. They were from Wyoming, Illinois, Texas and Oklahoma. 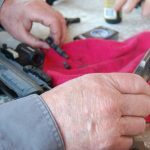 What they had in common though was the determination to pertect their defensive skills and learn more about competent gun handling. They struggled with heavy triggers and carry pistols that were small for their hands and holsters that were less than ideas. This is not an easy class and they are told it would not be fun, but would be a lot of work! They found that out and relished the challenges, including the WY wind! 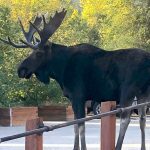 And the moose in the parking lot on Sunday morning! Each night they returned to the hotel for wonderful dinners placed graciously in front of them by Chef Susan with desserts beyond description! And they went home on Monday, tired but confident. What a weekend! It was Father’s Day, and Benita came to class "for the team". It was her husband’s wish that she and their three young adult children (two sons and a daughter) attend a DTI Defensive Handgun class. It was undoubtedly the least enjoyable way Benita could imagine to spend the weekend. Saturday was so hot and miserable that it was surprising anyone could speak, listen or learn anything. We all struggled on through however and amazingly everyone did learn. The heat was not the only frustration. Both Benita and her daughter Rachel had brand new, right-out-of-the box Glock 42s. And, as sometimes happens with new 42s, usually as a result of the low power practice 380 ammunition, the guns were consistently one shooters. Benita and Rachel were listening, in spite of the heat, and quickly mastered clearing stoppages and they were speedy at it in no time! But frustrated beyond, beyond! Eventually the temperature went down, along with the sun and class ended in the cool of the Hoosier twilight. Morning brought cooler, fresher air! And, a switch to a S&W M&P Shield 380 EZ sparked the beginning of accuracy and solid gun handling skills other than clearing stoppages for both of them! Now it was possible to fire more than one round. Now it was possible to see multiple hits on the target which were is the desired location. Now it was possible to see how resetting the trigger works. Now it was possible to imagine using a handgun for self protection. Now it was possible for Benita to imagine…..oh wait. When did that moment happen? Was it because she struggled and struggled and master accuracy and the trigger in spite of the frustration? Was she learning inspite of the miserable circumstances? Oh yes she was! And when she realized what she had mastered, you could see the confidence in the set of her shoulders and the tilt of her head. Yes, she could do this! And Rachel too, but she had been more positive from the beginning and saw the benefit immediately for herself. But the best was yet to come. Benita proudly passed the final drill confirming that she could handle a gun competently. And then, (I could hardly suppress a grin), when Benita went to her husband and said that if she just had a Shield EZ she would be so happy. And she made that Father’s Day one of the happiest her husband could have imagined! Way to go Benita! And Rachel too! Sue asks: Dear Mabel, I love to wear skinny jeans but now that I want to learn to carry concealed and get my permit, I’m not sure it will work. When try to put my Ruger LCP in my inside the waistband holster, I think I end up pointing the muzzle at ME because the holster is held in so tightly and then if I can get it in the holster, there is a huge bulge in the waistband! I love my skinny jeans more than the idea of concealed carry! What can I do?!! Mabel says: Sorry Sue. The answer is no skinny jeans! There just isn’t any extra room to accommodate inside the waistband carry without a being incredibly uncomfortable and creating a lump at the waistband and however far below the waistband that the holster and handgun extend. And, although you could cover that lump with a pullover concealment garment​, you would still be uncomfortable and it would not chance the fact that reholstering is now a very dangerous prospect. 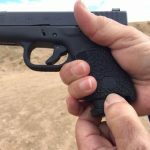 You need to be able to slide the muzzle of your handgun straight into the holster and NOT have to pry it in by first pointing it at yourself to facilitate getting the muzzle started into the top of the holster! Inside the waistband carry and skinny jeans are not a proper fit for each other! Just an update on the DTI Women at the Elk Mountain Hotel for 2017! Two classes are again scheduled and Susan at the hotel is preparing the rooms and menus! Level II class. Concealed Carry – Comfort and Action. June 2 (beginning 3 pm) to June 5 (breakfast). Learn to be comfortable carrying your handgun concealed, and be capable of drawing it and handling it under stress. Learn about movement and use of cover. Bring the gear you regularly use or want to use. Confirm your accuracy. Sept 8 (beginning 3 pm) to Sept 11(breakfast) . Learn to handle your handgun safely and competently. Learn to draw from the holster and be accurate. Learn also about avoidance and non-lethal skills and tools. The weekend starts with lecture on Friday afternoon followed by one of Susan’s fabulous dinners with time for getting to know one another. She will send us on our way, on both Saturday and Sunday, with a wonderful breakfast and picnic lunch. Each night we will return once more to the relaxing atmosphere of Elk Mountain Hotel for another excellent dinner and time to talk about the day and what we learned. Monday will see us all on our way home with new friends and new skills following Susan’s farewell breakfast. Which room will you get? The Ester Hobart Morris, the Lewis Armstrong, Eliza Swain, or the Jim Bridger? You can check it all out on the Elk Mountain Hotel web page www.elkmountainhotel.com and see photos on DTIWomen Facebook page. Come join us in wonderful Wyoming! The compact, single column size of the Clock 42 in 380 offers several advantages. 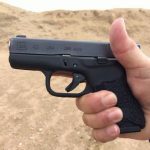 It works for people with average hands, great for smaller hands and is yet very usable for large hands, and concealable for most everyone. A great choice. Robar Guns, however, has come up with some customized features which enhance its usability. Here are photos of my G42 which just returned from Robar Guns with the custom features which work for me. 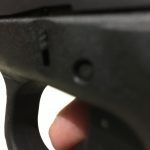 First, the forward end of the trigger guard has been rounded while the High Grip Modification, done where the trigger guard and the grip meet, allows someone with very short fingers to snuggle up high behind the trigger guard and have a shorter reach to the trigger than the original design. Then both the grip and the trigger guard have been give a pebbly type texture, easy on the hands but allowing for a secure contact between hands and the grip. The Half Moon cuts at the base of the grip are great for actually being able to grasp the base of the magazine for efficient removal. A great solution for small hands and big hands. 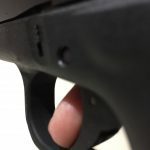 Additionally, the Vickers Slide Release has a slight roll at the top so that there is just enough contour to make it readily operable for all thumbs also as a slide lock. The Ameriglo Spartan Operator with Tritium can quickly draw the eye in for immediate sight alignment. And finally, between the Ghost Edge Connector and the N3 Metal Finish on all the internal parts, including the barrel, everything that moves does so with incredible smoothness. Freddie Blish and his crew of skilled and competent gunsmiths did a fantastic job! Thank you! I decided to wait for the return of my PolymAr15 VF before addressing the third day at Gunsite with Robar Guns. Nothing was done to change the performance, no need because it has never even had a hiccup, but now has a couple of updates. It now has a BCM Wolf Gray Stock (formerly black) and the same gray polymer keyed grip panels. 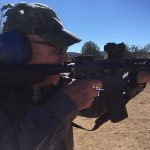 Although I have been using this rifle for classes for just shy of two years and am well familiar with its benefits, it was exciting to watch men who are used to the typical heavy AR use a variety of the PolymAR15s Robar offers! No one complains when the rifle is as light weight as some handguns! Approximately 5.5 lbs, +/_ hanging off your shoulders instead of 9 plus! Incredible! 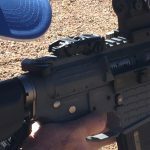 Quick to mount to the shoulder and just as quick to stabilize and find the sights, wether Aimpoint Red Dot or iron sights. A smooth crisp trigger, and just as crisp trigger reset enhances your ability to get right back on the target for efficient accuracy. So, no matter if you are 5 ft tall or over 6 ft tall, this rifle has its place when efficiency is paramount. Or, when wearing a rifle for assigned extended duty time is required. Or when someone is of smaller stature or has a bad back or has plenty of other gear to carry. During our drills, we used the PolymArs at distances from 3 yds to 25 yds with timed drills. Excellent results, even when we went to the 200 yard range! And cleaning was a breeze with all the internal parts NP3ed! 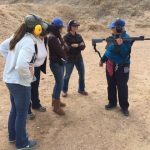 Here is a group of women who have never fired an AR learning that it isn’t too complicate, too heavy or too much recoil for them! They were astounded!